To Cite: Reiber H. Chronic Diseases with Delayed Onset After Vaccinations and Infections: A Complex Systems Approach to Pathology and Therapy, J Arch Mil Med. 2017 ; 5(3):e12285. doi: 10.5812/jamm.12285. Background: The medical community fails dramatically in the understanding of chronic diseases and development of causal therapies. Statistical associations between vaccinations or infections and autoimmune diseases or a multitude of chronic diseases remains without any scientific rational. The Gulf War illness, with an unexpected high health risk (34%) for military personnel after a manifold of vaccinations, points to the need of a scientific approach different from insufficient linear clonal selection concepts in immunology. Methods: Non-linear dynamics analyzed in time series, phase portraits, and mathematical models. Results: Three different types of chronic diseases, different from lasting acute diseases, are discriminated by Cerebrospinal fluid analysis and nonlinear dynamics. A nonlinear model for a virus-driven chronic disease explains the chronification of the infection, as one of the stable optional states between complete immunity and death. The model also helps create causal therapies and facilitating phase transitions to complete immunity based on individual connectivity in the immune network. Chronic diseases with a sudden change from stable health to a pathological but stable state are phase transitions based on metabolic fluctuations spontaneous or facilitated by external influences (via the immune, endocrine or nervous system). A reduced complexity in diseases is shown by the numerical analysis of time series (e.g., heart rate) or attractor phase portraits. In chronic diseases, with immune system associated pathology, vaccination or infection has to be regarded as a facilitator for a phase transition, like a catalyst, but not as the cause. With this causation we understand why no traces, like causative antigens, are found in Gulf War illness, chronic fatigue syndrome, post lyme syndrome, or the mild encephalitis in schizophrenia. Conclusions: The complexity approach shows why antiviral or antibiotic medications fail in chronic diseases. Disease as an emergent property should be investigated on the phenotype level. Nonlinear analysis of time series of the individual patient gives information not available from group statistics of molecular “multiscale” systems or systems biology. New research perspectives could base on the extended time of registry after vaccinations and should focus on causal therapies, which need financial support, independent from the medical-industrial complex, with its divergent interests. 1. Chronic inflammatory diseases with persisting causative antigen. 2. Chronic inflammatory diseases without persisting antigens but humoral immune response. 3. Immune system associated pathologies (ISAP) without pleocytosis or signs of a humoral immune response in CSF. Ad 1. The Fuchs’ Heterochromic Cyclitis (FHC) of the eye (3) can be used as an example of the first group with locally persisting rubella virus and specific rubella antibodies easily diagnosed by the analysis of aqueous humor (3). For this group there is no doubt that the antigen is the cause of the chronic disease. With a complex systems model (4) applicable to the FHC, it is possible to describe the formation of a chronic disease as a stable state, and additionally we can get an alternative view on therapy concepts for chronic diseases. Ad 2. The second group, which involves Multiple Sclerosis and autoimmune diseases with involvement of the CNS, like neurolupus and Sjögren syndrome, has been characterized by the polyspecific antibodies in CSF (5) synthesized in brain by arbitrarily immigrating B cells without any persisting antigen (6). This group is also characterized by its pattern in CSF (1, 2) with restricted barrier dysfunctions (albumin concentration quotient, QAlb > 12 × 10-3 in less then 1% of the MS cases) and a low frequency of increased cell counts (> 35/µL only in 3% of the MS cases) in addition to the polyspecific measles-, rubella-, varicella zoster-(MRZ) antibody reaction in up to 94% of MS patients (2, 5). In these cases the immune reaction cannot be questioned, however, the cause is unknown. Sixty years searching for a causative antigen failed completely, as shown by a metaanalysis of 5800 epitopes (7). Additionally the immigrating B cells have a specificity-independent influence in the pathologic process (6). Ad 3. In the 3rd group with a complete lack of the classic immune response in CSF, neither with a pathological antigen nor with a polyspecific antibody synthesis, CSF analysis may only be helpful by exclusion of other diseases (2). In a part of this group the chronic disease starts within 2 weeks to 2 months after infections or vaccinations (8). There exists a wide range of such diseases with an immune system associated pathology (ISAP), however, the association is only based on statistical correlations missing any rational as a base for therapies. This leads to fatal misinterpretations, like in the Gulf War illness (9-11), the post lime syndrome (12), autoimmune diseases (8), and the frequent chronic fatigue syndrome (CFS) or myalgic encephalomyelitis (ME) (13), characterized by the unsuccessful search for an antigen or by trials of inefficient therapies with antibiotic or antiviral medications. For a scientist it is not sufficient to have only statistical correlations but no rational for the connection. Therefore, it will be the particular target of this review to show a possible causation in a complex biological system different from the linear cause and consequence models. A huge number of different autoimmune diseases were diagnosed in patients less than 4 weeks after an infection (8). This observation remains so far without an explanation as there was no specific correlation between a certain autoimmune disease and a particular infection. However, there is no doubt about a connection, based on the statistical results (8). It has to be emphasized that this correlation must be between a clinically defined infection and the autoimmune response. The observation of an intrathecal antibody synthesis is not sufficient for the indication of an infection, as we learned from the polyspecific antibodies in MS (2, 5, 6). Nevertheless for the presence of an antibody species in the chronic diseases, the body must have had the contact with the real antigen. Rubella antibodies are observed in MS patients only if they previously had the disease or the immunization (6), a mimikry by epitopes from unspecific antigens is not existing in this context (6). Therefore, the earlier interpretations of increased antibody titers in the blood of GBS patients (14), as a cause of the autoimmune disease (15) are wrong. Meanwhile we have learned that this antibody and autoantibody response is part of a polyspecific antibody synthesis due to an individually different connectivity between different B cell clones (5). Over many years numerous reports have raised the question whether vaccines can cause autoimmune diseases (15, 16). The denial of the connection of vaccinations with the delayed appearance of a large variety of symptoms had scientific as well as political reasons. Regarding science, it was the ancient model of the clonal selection theory (17), which could not let imagining any other causality as antigen-driven immune responses like those described with the first group (above). The politically guided resistance came from a medical-industrial complex (18) with interests in a multitrillion dollar business. The largest ever, unintended immunological field experiment came with the mass vaccinations at the beginning of the first Persian Gulf War. About 12% of nearly one million soldiers from the war allies developed chronic diseases, now called Gulf war illness (9-11), with a multitude of symptoms, like chronic fatigue, cognitive impairments, multi-chemical sensitivity or chronic pain (19). The history of the research developments represents an example for the problems of the medical community as well as the society in general to deal with chronic diseases. 25 years of mainly retrospective or animal investigations and 10 consensus reports of the U.S. academies of science (9) did not give a real clue for any other of the possible war-associated causes. Therefore, one has to wonder why the association with the vaccinations has been so obviously ignored. However, there are clear statistically supported connections between vaccination and Gulf War illness, which deserves more consideration (19-23) described in this review. The Gulf War syndrome or dessert storm syndrome, now called Gulf War illness (GWI) was discovered after the first Gulf War in 1991. According to official US government sources, up to 110,000 diseased veterans have been reported till 1999. Many of the veterans are still seriously suffering after 25 years (9). The retrospective research in these vaccination-related chronic diseases is biased as there are barely reliable protocols, which record how many vaccinations in which intervals of time the individual soldier got (Vol 1 of (9)). This makes it crucial to carefully consider the contextual facts. 1. In the Persian Gulf War about 700,000 American troops and additional 80,000 English troops have been vaccinated with up to 9 vaccines in a short time interval of about 2 weeks, in many cases simultaneously. The spectrum of vaccines included: Anthrax (in UK, not in US, together with pertussis antigen as adjuvant), Plague, Tetanus, Cholera, Hepatitis A, Hepatitis B, Polio, Yellow fever, and Typhoid (19, 20). The Gulf War was also remarkable for the extraordinary high number of different exposures experienced by troops, including the chemical warfare agents released by the destruction of Iraqi facilities, extensive spraying and use of pesticides or medications given prophylactically to protect troops against hazardous exposures as well as hundreds of oil well fires set by the Iraqi troops as they withdrew from Kuwait (21). 2. Immediately after August 1991 about 25,000 troops were reported to have an unknown “illness” with a multitude of symptoms commonly including chronic fatigue syndrome, skin rush, cognitive impairments, multi-chemical sensitivity, and chronic pain (10, 20). A first Government review panel in 1994 (10) remained without results pointing to the poor database. The largest compilation of the international efforts to discover the cause of this illness is given in finally 10 volumes edited by the U.S. academies of science (9). The studies, which consider mainly toxic war agents (solvents, fuel, pesticides, nerve gas etc. ), long-term effects of blast exposures, leaking radioactive uranium, and their combinations, have investigated human cohorts and animals. Volume 5 (9) considers the possible influence of inflammatory diseases with a large number of microorganisms. The controversy about a possible role of mycoplasma in the Gulf War illness is representative for the unsatisfying database from the investigations (Vol 5 (9)). The very plausible idea to consider the role of multiple vaccinations was badly treated by the commissions. The consensus report (Vol 1 (9)) was strangely speaking about effects of “preventive medicine” or role of immunobiologics (Vol.1) just to avoid the world-wide common expression “vaccines”. Our publication in 1996 (11) explained the theoretical connection by a complex systems approach of the immune response induced the request for a proof by the astonished speaker of the Persian Gulf veterans’ coordination board. Twenty years later, this review may provide the answer. However, at that time, the missing data and the ignorance against the association with the vaccination had strange consequences for the patients: In the U.S. at least, these health problems were accepted quite early as a biological disease, since 1998 by law, to allow compensations for the veterans. However, this was different in the UK, where these symptoms were initially declared as a posttraumatic stress disorder (PTSD). The consequences were fatal: In the UK some of these patients have been treated with electroconvulsive therapy (The Guardian), a still common therapy in psychiatry. Meanwhile it is clearly shown that PTSD can’t explain the GWI (19). A first scientific rational for the role of vaccination in the Gulf war illness was suggested in 1997 by Rook and Zumla (21). They proposed a change in the cytokine pattern as the cause. It was also as late as 1997, where the public pressure as well as a report in Nature (20) blamed the government in UK to have used experimentally a pertussis vaccine as an adjuvant for the anthrax vaccination and in particular the missing of protocols regarding the treatment and surveillance of the UK serviceman. In the same issue (20) was a report with the title: “Critics Claim US Inquiry was Irreparably Flawed”. In the next few years studies followed, which based on the memory of veterans regarding their immunizations and exposures as well as discriminating between the time before and after deployment in the Gulf and at different battle fields (22). Finally a study appeared in 2000, which named the vaccines applied (still not the suppliers) referring to the small cohort of 923 UK servicemen, which had kept a private protocol of their vaccinations (19). A result was that multiple vaccinations in military personnel in the Gulf war were associated with subsequent ill health only in servicemen who received vaccines after deployment. Traditional stress of war, however, did not modify the effect of multiple vaccines and there was no interaction between the vaccines and the use of pesticides. However, there is a bias in the comparison between the groups immunized before and after deployment in the Gulf War: the possible chronic fatigue cases with vaccinations before the gulf war were, of course, not reached by a retrospective investigation of the group in active service and are therefore missing in the statistics for the risk in the group before deployment. In fact the comparison of veterans from different battle fields (22) showed that the non-Gulf war veterans also had the risk for Gulf war illness but with a much lower frequency than the veterans, which has been vaccinated after deployment in the Gulf War. The vaccination in the group after deployment was simultaneous or in a short time scale and contained in addition more frequent anthrax, plaque, and pertussis vaccines. The problem in all these retrospective studies, most relaying on the memory of the veterans, is the unavailability of objective vaccination protocols and professional medical reports. The most reliable results were obtained for the groups with vaccinations after deployment in the Gulf war, which reached a risk of 48% to get a multi-symptom illness or 34% risk to get a GWI with a more restricted definition (22). Nonetheless, there are no reliable quantitative data for the pre-deployment groups and in particular no data, which would allow to make conclusions for the vaccination in the normal population. Now, another 16 years later, with particular focus on neurological and psychiatric symptoms (23) including tumors, the effects may be more dependent on toxicant exposures, individually or in combination, like pesticide and pyridostigmin bromide exposures (as protection against nerve gas effects) inspite “effects of multiple vaccination cannot be ruled out” (23). There remains an unquestionable correlation between vaccination and Gulf War illness as a chronic disease with an immune system associated pathology (ISAP). Biological processes are biochemically controlled, e.g. by metabolic feed back mechanisms, which leads to a description by nonlinear functions, which are characterized by any quadratic term like in y = x2. Nonlinear functions are described by the complexity sciences (24, 25) and cannot be treated anymore as linear cause and consequence functions. This is the basic reason for the failure to understand chronic diseases. 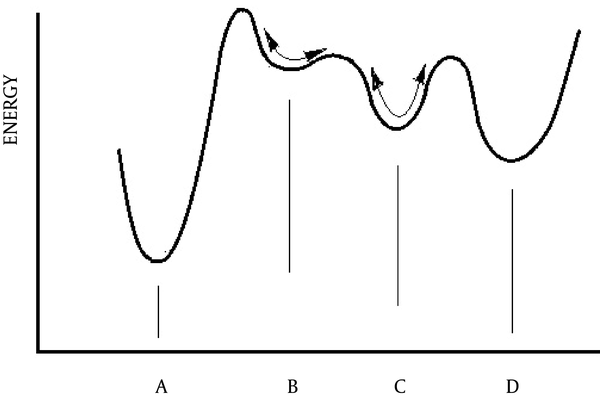 The first recognition of the particular properties of these non-linear processes was the glucose oscillation (Figure 1), published by Benno Hess (26). From a biological cell, with thousands of enzymes and metabolites, just 6 enzymes are the core pathway of the glucose metabolism. These isolated enzymes (hexokinase, phospho-fructokinase, pyruvate kinase etc.) are put together in a reaction tube. The supply with glucose leads to the production of CO2 and ethanol. The concentration dynamics can be directly recorded in a photometer for the change of absorption by an intermediate metabolite, the phosphoenol pyruvate (PEP). 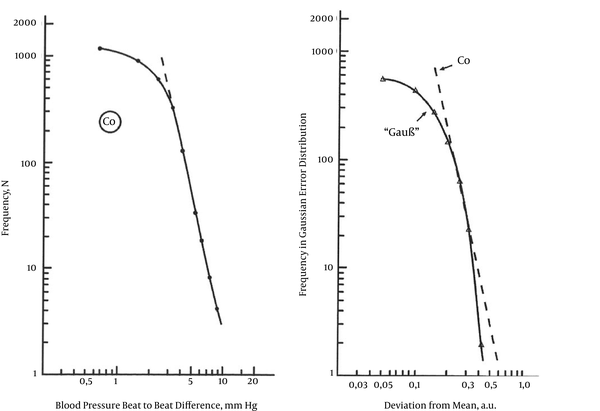 Figure 1 shows such an experimental record with fast changes of the PEP concentrations in the reaction system. By addition of a few permille of the total fructose-6-phosphate concentration, another intermediate metabolite, we can let the system change from a periodic to a chaotic turnover rate of the metabolites or vice versa, as shown in the time series for PEP concentrations (Figure 1). For the mathematical analysis of a change of the regularity in these time series s. below (section 7.2), the system shows the sudden change (phase transition) between 2 attractors due to a small fluctuation in the concentration of one metabolite. This causation in a nonlinear function (feed back control) is different from a linear cause and consequence (dose/effect) relation. Six enzymes (Hexokinase. Phosphofructokinase (PFK) etc.) are put together in a tube with reaction solution. The supply with glucose leads to the production of CO2 and alcohol. The concentration dynamic can be directly recorded in a photometer for the change of absorption from an intermediate metabolite, the phosphoenol pyruvate (PEP). Depending on the initial condition there is an oszillation or chaotic time series for the PEP concentration. The phase transition between the two states can be triggered by a fast addition or consumption of a small amount of the metabolite fructose-6-phosphate (F6P) (26). For the understanding of the implementations in a non-linear self-organizing process I will give two examples of complex systems approaches: one example (section 6) as a chronification model with disease as a selforganizing stable state. A second example (paragraph 7) will describe the causation for the change from a healthy state to the chronic disease (ISAP) as a phase transition. Biological, living systems exist only far from chemical equilibrium under consumption of energy. When an external parameter (such as temperature) crosses a well-defined value (point of criticality), we may get an abrupt change in the macroscopic properties of the system. This change is called phase transition (27, 28). Phase transitions are seen everywhere in nature, for example, when water is boiling or when vapor condenses to form droplets. The pressure dependent transition from laminar to turbulent flow, is a phase transition in which the coherence between water molecules increases, they act together, which is regarded as a selforganized creation of order, compared to the independent oscillating water molecules in the laminar flowing water. The principle is the self-organization, the spontaneous creation of order. The whole development of an organism (ontogenesis) has to be understood as a sequence of phase transitions between temporarily stable states (attractors). Stability is guaranteed on the level of the phenotype, the real form (morphogenesis). The genom provides the components but can’t provide biological stability (25). However there is no steering by the genom. The gene expression is itself a consequence of self-organization in the context of the local phenotypic properties (29). If, as shown in Figure 1, already 6 enzymes can run into a chaotic, dynamic system, what will happen with the interactions of the whole thousand enzymes in a cell? This is a self-organizing stable system in spite of all the molecular fluctuations, like, e.g., chaotic calcium concentration fluctuations inside the cell (30). Self-organization, development of order in open systems far from equilibrium are essentials of the conceptual framework of nonlinear dynamics, operating at the brink of criticality (27), which is achieved and maintained by self-organization (24, 25). Attractor: An attractor can be understood as a basin of attraction (Figure 2) in which the system persists in spite of local fluctuations, like a pendulum returns to the lowest point (point attractor). Figure 2 shows in an analogy to the energy diagram, used to describe the activation energy in chemical reactions, the principle: The transition from state B to C needs less strong fluctuations, however, needs more activation (external facilitation) to reach the point of criticality for a phase transition like that between C and D or C and B. This makes the state C as a more stable state then B. Fluctuations in the controlled biological reaction may let the system go through a phase transition to another stable state. 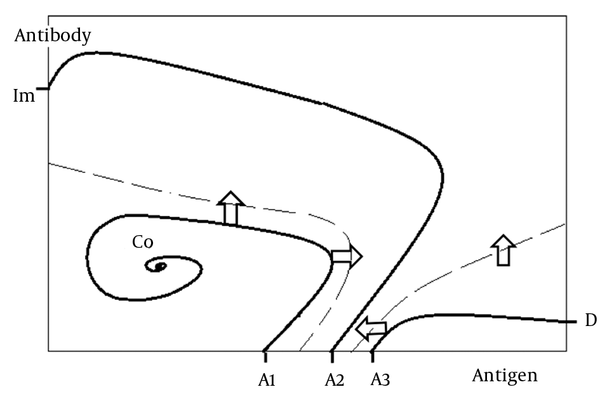 The diagram uses the energy diagram for demonstration of the activation energy in chemical reactions to demonstrate the relative stability of attractors. The least stable state is the state B with minor fluctuation it can change into state C. State C needs much stronger fluctuations i.e. the probability to find the regulation in B or D is so low that only an external trigger may allow a phase transition. The deeper the basin of attraction the more stable the system is, the more energy, or stronger fluctuations are necessary to pass the point of criticality for a phase transition to another attractor. A phase transition can happen without any external influence as well as by a multitude of different agents (8). The relative frequencies of unforced appearance of diseases in a human society may depend on the stability of the different relevant regulation processes. External influences just increase the probability of the development of a disease. In case of a Fuchs’ heterochromic cyclitis (FHC) the disease is locally restricted to one eye along with a general, systemic immunity against a rubella virus infection (3). In this disease we were lucky to have found the locally persistent rubella virus as the unambiguous cause (3). However, this does not yet provide the causation for the chronic pathological process in the one individual eye. A perfect explanation for a chronification of an immune reaction comes with the mathematical model of Mayer et al. (4), reviewed in Figure 3. In the competition between the rate of virus replication and immunological defence reaction (here represented by the neutralizing antibody formation rate) either immunization or the virus may win. In intermediate cases starting with a low viral load, the process may find a stable state (attractor) in which the both processes remain coexistent, the virus is not completely eliminated and the organism does not reach complete immunity. Typical for nonlinear processes (like all biological functions) the outcome depends on the initial conditions of the system, here the initial viral load (Figure 3). Mod. according to Mayer et al. (4). Depending on the initial conditions (viral load, A1, A2, A3) and the given reaction parameters the immune reaction is leading to immunity (Im), to death (D) or to coexistence (Co) of virus and antibodies with different shapes of the attractors (4). Disease is a quality, which is not represented in any of its constituents. Therefore, this kind of research project needs to investigate the dynamics of the disease (i.e., to watch the patient or in-vivo organ function) before its molecular components. This is in contrast to the approaches of linear statistic treatments in ‘systems biology’, which is believed to get reasonable information by a cumulative big data approach in multiscale analysis of the components (31, 32). It is a characteristic of nonlinear systems, that we cannot prognose by any means, neither from an individual parameter analysis nor from accumulation of several dynamics, the shape or complexity of the attractor, like the individual outcome of the virus infection in the Figure 3 (24, 25). As a second result from this complexity approach we can get ideas for a causal (!) therapy for this kind of chronic diseases with persisting antigen in Figure 3: The right zone with initially high viral loads represents the conditions of the winning virus replication as far as there is no antiviral treatment (arrow to the left) or, e.g., by immunoglobulin treatment (upward arrow) (33, 34) to cross the dashed line towards the middle zone with processes to general immunization and elimination of the virus. This change is called a phase transition and the dashed line represents the points of criticality, where the system is at the brink between both stable states, called attractors (Section 5). For the chronic cases in the left zone with low viral loads we have to find similar solutions for a phase transition into the middle zone which leads to immunity: This could just be by a seemingly paradox boostering of the immune response (arrow to the right, increasing antigen) or an increase of the antibodies by an immunoglobulin therapy (arrow upwards). This example shows a solution for a causal therapy in chronic diseases: To bring the stable state by a transition through a point of criticality to another stable state. However, this never fits to a linear cause and consequence model. Immunoglobulin therapy: The above example could also be the reasoning for the known efficacy of the immunoglobulin therapies in some autoimmune diseases (33, 34). In particular, it explains the restriction of efficacy: It depends on the combination of antibodies in the batch-to-batch varying immunoglobulin pattern, with a different interference with the connective immune network (5, 35). Activation therapy: More complicated is the practice for the first proposal to booster the on-going immune reaction. Such a boostering must not be antigen specific, as we learned from treatment with beta-interferon of patients with a severe virus-encephalitis in intensive care (36). The intrathecal treatment of the comatose patients led to a sudden increase in CSF cell count and a strong intrathecal humoral immune response, which was before treatment at a very low level. This led to astonishing clinical improvements in 2 of 3 patients (36). As confirmed in later investigations, there is a high probability that the effect came from contaminations of the beta interferon, which was produced at that time in fibroblasts (36). This experience supports the concept of a causal treatment by change of a stable pathological state as a phase transition. Both therapy examples with the immunoglobulins or unspecific activation of the immune response are effective by their interference with B cell clones in the frame of the individual network connectivity of the immune system (35). An example for this individually varying, polyspecific activation of antibody, and autoantibody producing B cell clones in the immune system was recently shown for the Guillain Barre syndrome (5). In our 3rd group of chronic diseases (introduction), with an immune system related pathology (after vaccinations or infections), however, without any detectable causative antigen or a cellular and humoral immune response in CSF, it seems much more complicated to describe the pathomechanisms. In fact this is a relevant situation for a large group of diseases for which we observe a ‘sudden change’ from health to disease. A more common example is the sudden development of hypertension in women with anti-conceptive medications. After stop of the hormonal medication the high blood pressure persists. The usual treatments for hypertension can only influence the symptom, i.e., suppress the high blood pressure, but can’t change the stable pathological state. The initial (hormonal, etc.) trigger of the phase transition disappeared; however, the new stable regulation state persists without a trace of the initiating trigger. In this sense we will consider the infection or vaccination as a trigger but not as the cause of the Gulf war illness, the post lyme syndrome, chronic fatigue syndrome or autoimmune diseases. However, how can we detect the change to a pathological condition? In the first 2 groups of chronic diseases (introduction) we find diagnostic relevant changes in CSF parameters. In this third group, without changes of molecular properties, but with phase transitions between attractors, we need to refer to characterization methods of non-linear dynamical systems, like the regularity of time series or fractal dimension as a measure of complexity. The developmental process of an organism (ontogenesis) with phase transitions between different attractors (37) is characterized by an increase of complexity. Vice versa, in medicine, we find many diseases with a decrease of complexity (38, 39). The following example of heart diseases (39) is shown to explain the analytical methods, which use the change of the regularity in time series to characterize this change in the complexity of the system (40). A series of equidistant data points measured for a single parameter is called time series. If the subsequent data points are connected by an algorithm (any rules, mathematical functions, etc. ), the time series are called deterministic. They can be regular (e.g. oscillations) or irregular (not to be resolved by a Fourrier analysis). If there is no functional connection between subsequent data points we call this noise. Noise can be treated by a Gaussian error function in common statistics where the sequence of the values is ignored. In a deterministic time series, the evaluation can’t destroy the sequence of data points without losing the information about the regularity. The international consensus of cardiologists for the detection of a change in the heart rate variability (41) makes exactly this fault by analysing coefficients of variation (CV). Still the use of averages from CV of several time sequences does not compensate the deficit of the linear statistical evaluation for a non-linear deterministic (chaotic) function (section 7.3). The quantitation of the regularity of a deterministic time series determines the rate of entropy production of a dissipative system (24). For the quantitation of the irregularity, different entropy measures have been developed like the Kolmogorov-Sinai (KS) entropy (42), Lyapunov coefficient or the correlation dimension (42). These solutions were created for true dynamical systems without noise and with the need for an infinite set of data points. For the reality of biological time series, with a mixture of stochastic and deterministic components and a very limited number of data points available, other solutions had to be found. The approximate entropy (ApEn) developed by S. Pincus (43) can work with a set of 75 to 5000 data points and is insensitive for outliers and noise typical for in-vivo measurements. The program for ApEn analysis can be developed by the algorithms given from Pincus (43) or found as free download in the internet. This analysis can discriminate cases of heartbeat variability (40), which are not different in the classical statistics (41). Vice versa a difference in CVs does not necessarily mean a change in complexity. N= Xs transferred into log N = S logX. Such a geometrical evaluation in a double logarithmic diagram is shown for the systolic blood pressure variation of normal probands (44). The left diagram shows a self-similar, fractal time series concluded from the linear slope S and the right diagram shows a statistical (Gaussian) distribution of the variation in a time series of noise. By this method of fractal dimension analysis (Figure 6) the decrease/increase of complexity can be expressed numerically by a change in the slope S.
The absolute value of the fractal dimension (e.g. 3.1 or 4.7) is not relevant, it is the direction of change by a phase transition which counts. Investigation of heart diseases is one of the examples, which shows the decrease of complexity in a pathological state by the change of regularity in time series. Figure 4 shows the beat-to-beat intervals (R-R intervals, tachogram) derived from an electrocardiogram, ECG (40). The values from the differential tachogram (Figure 4) are recorded as a function of time to get a time series as shown in Figure 5A. The differential tachogram values (interval variation) are registered as a function of time. The evaluation of an uninterrupted sequence of data in a time series of data points (Figures 1 and 4) is crucially different from the statistical evaluation with means and variation coefficients of data groups (40). This is is modified from (39). The upper row shows the time series and the lower row the corresponding phase portraits (attractors) in return plots (39). Data are from the thesis of S. Schermann (44). The double logarithmic plot for data from proband samples (control, Co) with a linear slope indicates an algorithm in a fractal time series, different from a curve for a statistical distribution (Gaussian) of variations in the time series (noise) in the right diagram. 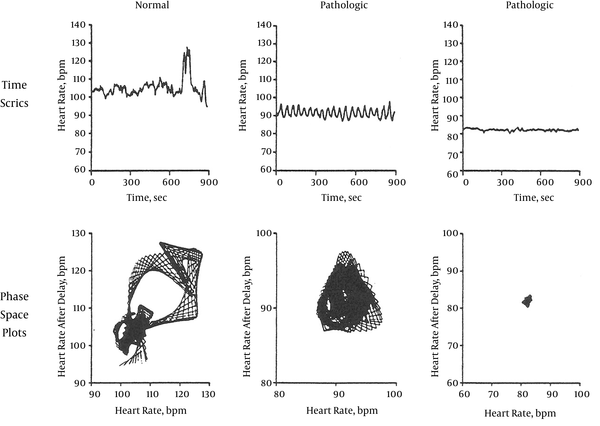 The Figure 5 shows data from 3 individuals, a normal control, a patient with a tendency to heart chamber fibrillations, and 1 patient with a Guillain Barre sydrome (GBS) in intensive care. The differences in the ECG of the 3 individuals is already recognizable in their time series Figure 5 (39): The time series of the normal control are deterministic chaotic and scale invariant (39) following a large scale power law (25), the patient with the heart disease shows a rhythmic oscillation of only 2 different time intervals between heart beats and the GBS patient has a repetition of a single constant time interval (no variation in the R-R intervals). The corresponding return plots show this with a ring cycle-like phase portrait, which changes into a collapsed ring cycle and for the GBS into a sharp point attractor. These data shown in Figure 5 document graphically the decrease of complexity. With a corresponding lower stability of the state, this analysis could also be regarded for a risk prognosis. The fatal meaning of this comment was seen in the case of the patient with the heart disease in Figure 5B who died 2 weeks after this investigation in an uncontrolled moment from a letal chamber fibrillation (39). In general, for this very efficient interpretation tool, we need large enough data sets with an uninterrupted sequence of data points, which can easily be gained by non-invasive methods like ECG or electroencephalogram (EEG), but are rare from other sources so that ApEn analysis (40) still may not be applicable. As a rare example from large enough data sets from blood sampling it could be shown by the variation of the parathormone concentrations in blood that patients with osteoporosis (38) have a similar tendency as in the heart diseases: the disease has a lower complexity of regulation. Another relatively well known, very impressive, example is the change from a normal chaotic alpha wave pattern to a rhythmic pattern in the EEG of a patient with an epileptic seizure (38). Such an epileptic seizure is heralded by the change to lower irregularity of the alpha waves time series already long before any other signs in the seemingly normal EEG or before the aura informs the patient about an upcoming seizure. This is a particularly impressive example of time series analysis in medicine (45). The complexity approach allows understanding the different causation and time course in acute and chronic diseases. However, there remains the question why the same infection can make a multitude of autoimmune diseases at different organs (8). What is the difference in involving either the immune system, the nervous system, or the endocrine system? In the search for a pathomechanism, which can connect the multiple organ failure with vaccination in the Gulf War illness, the proposal of vaccination-dependent changes in the cytokine pattern (21) is still a very interesting model with more dimensions then expected initially: cytokines have a functional pleiotropism (46), i.e. a particular cytokine may have different effects at different receptors in the immune system, the nervous system and the endocrine system. However, there is also their functional redundancy (46), which means that different cytokines may have the same effect on a single target cell. With their 3rd property, the concentration-dependent pro- and anti-inflammatory function cytokines form a network involving many organs (11, 27). Such ubiquitous multi-organ influences may explain why we have not just immune reactions but also nervous system or endocrine system illnesses in an immune system associated pathology (ISAP). This consideration could also give the rational for a mild encephalitis hypothesis of schizophrenia (47). Neither the decreased CSF flow rate (48), nor the detection of changes in the cytokine pattern is an unambiguous sign of an antigen-driven immune response. Some patients with Schizophrenia may have a history of immune system associated pathology (ISAP) or a nervous system- or endocrine system associated pathology, or in another fraction of the patients it may happen as an uninfluenced spontaneous fluctuation leading to a phase transition in certain brain functions. The actual suggestion (49) that the different adjuvants used with vaccines are the cause of the vaccination-associated diseases is again a linear cause and consequence approach. As long as it is not just a metabolic poisoning of the body, it has no aspects of what we observe with the dynamics of chronic diseases. This proposal is additionally refuted by the fact that the wild-type infections can trigger (without adjuvants) the same diseases as vaccinations with adjuvants (8, 19). A chronic disease represents a stable state as one of the different optional stable states a complex biological system may have. A causal therapy may be possible by a phase transition and interference with the connective B cell populations in the individual immune network. Any successful therapy could be detected by a change in the fractal dimension. In these chronic diseases, vaccinations or infections have to be regarded as a possible facilitator, like a catalyst, however, not as the cause. The cause comes with the possibility of phase transitions between different attractors (basins of attraction in Figure 2) of the organism, which can also appear spontaneously by a strong biological fluctuation. Concentration fluctuations in a system with a stable attractor are the characteristics of an adaptive system, however, bare the unavoidable risk of a phase transition to a disease. We can’t avoid diseases but we can learn to deal better with the chronic diseases. As a perspective, complex systems must get more awareness in school education and universities, replacing to some extent the dominating molecular view on biology (25). The relevance of the vaccination-dependent pathologies in the normal population could be investigated by extension of the registry of post-vaccination problems up to two months. This would close the gap of information not provided by the investigations of the Gulf war illness. It may be quite helpful if this research is financed by independent sources as the medical-industrial complex (18) has divergent interests. I strongly appreciate the inspiration of this complexity approach in medicine by my tutor for many years in complexity research, Brian C. Goodwin, UK. I would also like to thank my former doctoral student, Silke Schermann, for the creative cooperative work on blood pressure variability and Karl Bechter for engaged discussions and introduction in diagnostic approaches in psychiatry. Declaration: The author declares that the review was conducted in the absence of any commercial or financial relationships that could be construed as a potential influence on the scientific content.